I am lucky enough to have just returned from an extended visit to Italy, where we walked, ate and drank our way through Florence and the Tuscan countryside. 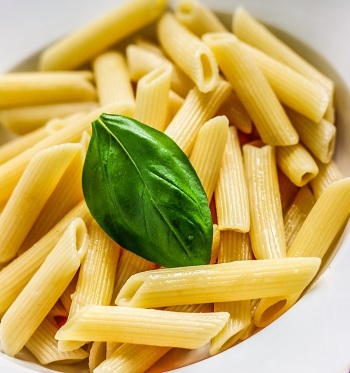 In Italy, pasta is a staple, eaten almost daily by many Italians. Not always served doused in red sauce or paired with meatballs (which are traditionally eaten on their own, not with pasta), pasta can make a delightful first course, or primi, or it can be the main star of a meal. 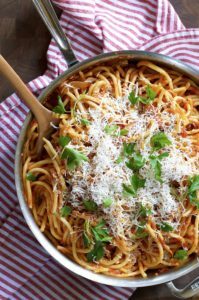 It’s even shockingly easy to make your own, although fresh or high-quality pastas are easy to procure at the grocery store. For these dishes, high quality ingredients take center stage. Serve these dishes as a sophisticated starter, or a main with a simple salad and crusty Tuscan bread with olive oil. 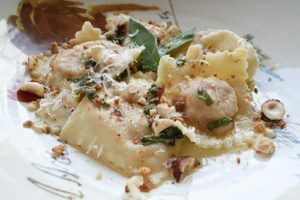 Tortelli con Zucca – this simple pasta is filled with savory cookies and creamy pumpkin and perfect for fall. 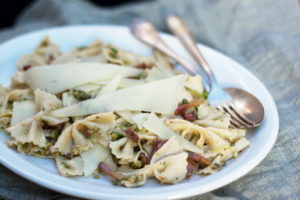 Farfalle Pistacchi e Pancetta – Pistachos may sound an odd choice for pasta, but the crunch of these nuts pairs perfectly with the creamy texture of the pasta. This savory dish is a great weeknight meal. Spaghetti Allo Scoglio – Frutti di Mare – Fresh seafood pasta is an effort to make, but is totally worth it with fresh, high-quality seafood. If you don’t care for one of the items, simply sub in another, or add more of one of the listed items. Gnudi – “Naked” ravioli is a common dish in Florence and we love this simple option. 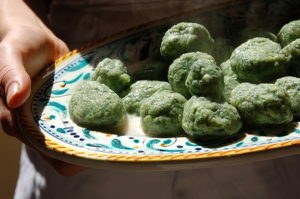 It’s a large, spinach and ricotta pasta that resembles a dumpling or large gnocchi. 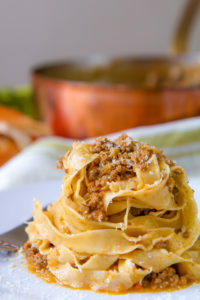 Ragu alla Bolognese – A traditional bolognese sauce is the perfect marriage of meat and sauce, and paired with fresh pasta, it makes a hearty dish ideal for Sunday dinner. Bucatini Alla Matriciana – Simple and filling, this dish stars pancetta and bucatini pasta, with chili flakes for a bit of spice. 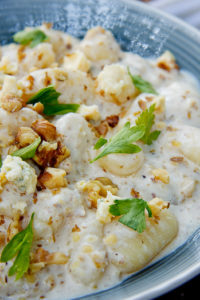 Gnocchi – A potato based pasta, the perfect gnocchi are simple pillows of dough, and they stand up well to this gorgonzola and walnut sauce, which is hearty but not overpowering. If you like gorgonzola, you’ll love this dish! 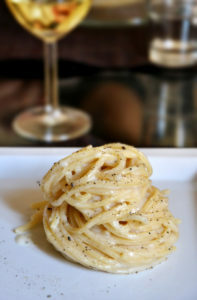 Cacio e Pepe – Spaghetti with simple cheese and pepper, this is one of our all-time favorites, a comfort food akin to mac and cheese.